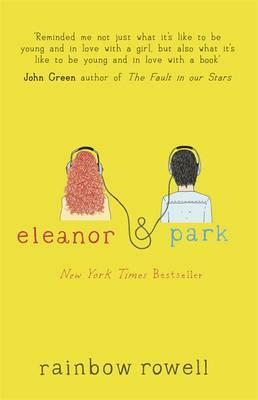 Eleanor and Park is a novel about two sixteen year-olds from Omaha, Nebraska in 1986 and teen love against the odds. Eleanor is new in town. Eccentrically-dressed, chubby and with unruly flaming red hair, she stands out for all the wrong reasons. Eleanor comes from a troubled family, is withdrawn and for the first time, the school misfit. Park is the quiet and steely half-Korean boy trying to stay off of everyone’s radar whom Eleanor has no choice but to sit next to on the school bus. Eleanor and Park overcome their bus-seat discomfort each morning by slowly communicating non-verbally, through shared interests in comic books and music. They bond over songs and rock groups. Slowly, they fall in love and non-conformingly defy all and everyone around them to be together. Even if, for Eleanor’s safety, it means keeping their relationship a secret from her family. Even if it means that Park has to fight for Eleanor. Eleanor and Park come from different backgrounds and it’s a refreshing change to have adults play more than bit parts in a YA novel. Park’s small, stylish Korean mum is all about looks, hair and makeup and his ex-veteran Dad looks like Magnum P.I. Park seems to have everything while Eleanor nothing. Her family are poor but she’s more worried about staying out of her violent step-dad’s line of vision than any materialistic item. Their need to be together proves breathtaking and dangerous and Park’s need to keep Eleanor safe and protected culminates in a page-turning finale. Entertaining secondary characters such as Park’s eccentric mother and Eleanor’s two African American friends, DeNice and Beebi bring some light into the darker themes explored in this novel. The story is told through alternate points of view – both Eleanor and Park’s – and Rowell has captured both voices beautifully. Rowell doesn’t brush over the hard issues teens face, she dissects them and examines them and lays them bare for all to see. The book also explores issues of sexuality and therefore is not recommended for younger readers. Rowell is also the author of Fangirl and writes for teens and adults.